The civilization of the Indus River at Mohenjo-Daro and Harappa arose at about 2500 BCE and ended with apparent destruction about 1500 BCE. It is uncertain whether this civilization had its roots in Sumer or Sumer had its roots in this civilization. Apparently the Indus civilization was likely destroyed by the Indo-European migrants from Iran, the Aryans. 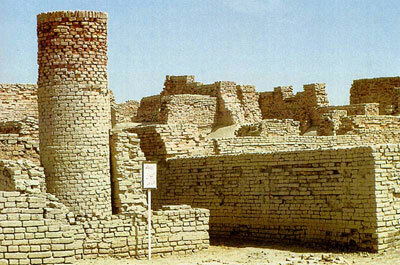 The cities of Mohenjo-Daro and Harappa were built of fire-baked bricks. Over the centuries the need for wood for brick making denuded the countryside and this may have contributed to the downfall. The written records of this civilization have not yet been deciphered. The layout of the cities in this civilization of 2500 B.C. is surprisingly neat and orderly. The cities had not only brick-lined streets but also a brick-lined sewer system.